Although research shows that most of today's college students adopt and use social media at high rates, many higher education professionals are unaware of how these technologies can be used for academic benefit. Author Reynol Junco, associate professor at Purdue University and fellow at the Harvard Berkman Center for Internet & Society, has been widely cited for his research on the impact of social technology on students. In Engaging Students through Social Media: Evidence-Based Practice for Use in Student Affairs, he offers a practical plan for implementing effective social media strategies within higher education settings. 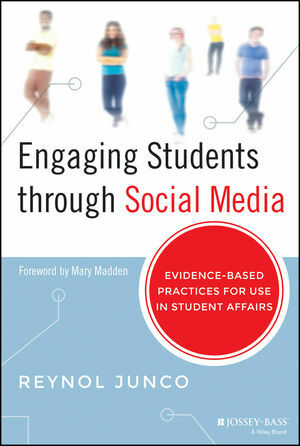 The book bridges the gap between a desire to use social media and the process knowledge needed to actually implement and assess effective social media interventions, providing a research-based understanding of how students use social media and the ways it can be used to enhance student learning. The benefits of social media engagement include improvements in critical thinking skills, content knowledge, diversity appreciation, interpersonal skills, leadership skills, community engagement, and student persistence. This resource helps higher education professionals understand the value of using social media, and offers research-based strategies for implementing it effectively. REYNOL JUNCO is an associate professor of education in the School of Education at Iowa State University and a fellow at the Berkman Center for Internet and Society at Harvard University. His primary research interest is using quantitative methods to analyze the effects of social media on youth psychosocial development, engagement, and learning.